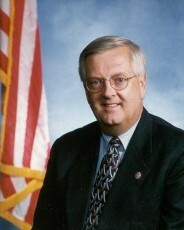 Curt Weldon is a former 10-term Republican congressman from Pennsylvania known for his support of hawkish U.S. foreign policies, including extravagant missile defense programs and an expansive “war on terror.” Weldon lost to Democratic challenger Joe Sestak in the 2006 midterm elections in part because of his close association to the George W. Bush administration’s pro-war agenda. Weldon was also tied to numerous scandals that broke during the run-up to the election regarding his cozy relations with an Italian weapons manufacturer and other foreign businesses. Despite being the focus of a federal probe for alleged influence peddling (he was never indicted), Weldon was able to capitalize on his long experience on Capitol Hill after leaving office. He has been an executive at a defense contactor—Defense Solutions—served on the boards of various companies, including Novo Energies Corporation, and represented a host of other businesses. During his time in the House, Weldon gained a reputation as one of Congress’ most militant hawks, especially on missile defense and Iraq. While serving as a senior member of the House Armed Services Committee and former chair of the Military Research and Development Subcommittee, Weldon described himself as "the leading House supporter of a national missile defense to protect America's families and communities" in his House bio. Weldon backed up his legislative efforts by supporting several militarist policy institutes, including the neoconservative Center for Security Policy (CSP), run by former Reagan administration official Frank Gaffney, and the generally hawkish Institute for Foreign Policy Analysis, whose consultants have included Ilan Berman of the American Foreign Policy Council, Henry Cooper of High Frontier, Michael Eisenstadt of the Washington Institute for Near East Policy, as well as long-standing hawks William Schneider Jr., William Van Cleave, and James Woolsey. Summarizing Weldon's views, Ari Berman wrote in a 2006 article for the Nationthat the congressman "believes there are weapons of mass destruction in Iraq. He claims a secret Pentagon unit, Able Danger, identified 9/11 ringleader Mohamed Atta two years before the World Trade Center attacks and covered it up. He wrote a book last year alleging that Iran was plotting to hit the U.S. homeland." Weldon's conspiratorial views were on full display in the weeks before the 2006 midterms after news broke of official investigations into his relationships with foreign businesses, including the Italian arms manufacturer Finmeccanica. According to the New York Times, although the Justice Department refused to comment on the Finmeccanica allegations, officials acknowledged that the department was investigating Weldon's connections to a number of foreign firms, including whether he "used his position to steer almost $1 million in consulting contracts from a Russian energy company and other Eastern European interests to a lobbying firm headed by his daughter Karen." A frequent booster of military hardware deals for the company, Weldon saw that his suburban Philadelphia district—along with his friends and family—benefited from the company's largesse in recent years. The company broke ground on a $27 million expansion in Philadelphia in November 2005 and employed a number of Weldon associates at its subsidiaries. Responding to the investigation, Danielle Brian, executive director of the Project on Government Oversight, told the Times: "Doesn't the congressman have to register as a foreign agent? It's always disturbing when a member of Congress goes to bat for a particular company. It is even more alarming when the company is foreign. When it comes to national security, you want the best products, not products from companies with a relationship to a member of Congress." In September 2006, the Citizens for Responsibility and Ethics in Washington (CREW) included Weldon on its list of the "20 most corrupt members of Congress." Responding to the report, Weldon's spokesperson charged that CREW was a "front group for liberal Democrats who have a partisan ax to grind against Republicans"
According to Berman, Weldon argued that Sestak spent much of his 30-year Navy career "drinking out of your wine goblets and being waited on by your sailor servants." Weldon also challenged Sestak's decision to have his 5-year-old daughter—who was diagnosed with brain cancer—treated in Washington, DC instead of Philadelphia, and "called the cops on an 18-year-old Eagle Scout and Sestak volunteer who was taking notes at a Weldon campaign event." On national security policy, Weldon often used his House bully pulpit to argue about purported threats to the homeland from "rogue" state intercontinental missiles. To defend against this supposed threat, Weldon championed expensive missile defense systems, working in close collaboration with a number of major U.S. defense contractors—like TRW, Boeing, and Lockheed—whose representatives at one time shared seats with Weldon on the Center for Security Policy's National Security Advisory Council. Commenting on the relations of CSP's council members, a TRW rep told the World Policy Institute: "We're a tight-knit group." Other key sponsors of missile defense programs who also served on the CSP council include former Rep. Christopher Cox (R-CA), Sen. Jon Kyl (R-AZ), and former Sen. Bob Smith (R-NH). Earlier, in 1997, Weldon was instrumental in establishing the purportedly bipartisan Commission to Assess the Ballistic Missile Threat to the United States, sometimes called the Rumsfeld Missile Commission after its chair, Donald Rumsfeld. The commission, which received funding in an amendment inserted by Weldon to the 1997 Defense Authorization Bill and was staffed by a number of hawkish foreign policy elites (including Woolsey, Paul Wolfowitz, and Stephen Cambone), was heavily criticized by observers for over-hyping the missile threat. The commission's final report, released in July 1998, contended that "rogue states" such as Iraq, North Korea, or Iran could deploy ballistic missiles within "five years of a decision to do so," contrary to the CIA's estimate that it would take at least 10-15 years (for more information, see the World Policy Institute’s Axis of Influence ). Despite heated criticism of the findings, the report appears to have had some impact. As Tom Barry reported: "Although initially challenged by the director of central intelligence, a little more than a year later, in September 1999 the CIA released a new NIE that was substantially more alarmist than its previous one. It predicted that North Korea could test a ballistic missile capable of hitting the United States 'at any time' and that Iran could test such a weapon 'in the next few years.' Commenting on the new threat assessment, Rep. Curt Weldon, a main sponsor of the Rumsfeld Commission, congratulated himself: 'It was the largest turnaround ever in the history of the [intelligence] agency.' House Majority Leader Newt Gingrich (R-GA) was similarly ecstatic, saying the commission's conclusion was the 'most important warning about our national security system since the end of the Cold War.'" Not surprisingly, weapons contractors were among Weldon's most ardent financial backers. The World Policy Institute reported: "During both the year 2000 and 2002 election cycles, Lockheed Martin, Boeing, and Raytheon were among Weldon's top 20 donors. In all, Rep. Weldon received donations totaling more than $157,000 from defense contractors during the 1999/2000 and 2001/2002 election cycles. These contributions represented roughly one out of every five dollars received by Weldon during these two election cycles. Weldon also received substantial funding from missile defense contractors and their employees working on missile defense projects near the army's missile defense command in Huntsville, Alabama." In 2004, Weldon was one of six congressmen who attended a fundraising event at the Dirksen Senate Office Building in Washington at which the Rev. Sun Myung Moon, a convicted felon and owner of the right-wing Washington Times, crowned himself "savior, Messiah, Returning Lord, and True Parent." At the event, which was cosponsored by the Washington Times Foundation and the International Interreligious Federation for World Peace, Moon claimed that "Hitler and Stalin have found strength in my teachings, mended their ways, and been reborn as new persons." When news of the bizarre event made headlines, most of the congressional figures disavowed that they knew in advance the event was meant to be a coronation. Weldon's office initially denied reports that he attended the event but reversed itself after being shown photos. A Weldon spokesperson said that the congressman "had no idea that the Reverend Moon was going to be at this event. If we had known that Reverend Moon was going to attend the event, be crowned, and make an unbelievably interesting speech, the congressman likely would not have attended." Greg Giroux, "Navy Vet Sestak Coming Closer to Sinking Weldon in Pa. 7,” New York Times, October 13, 2006. Novo Energies press release, Novo Energies Corporation Announces the Appointment of Congressman Curt Weldon to Its Advisory Board, July 8, 2009, http://www.reuters.com/article/2009/07/08/idUS213550+08-Jul-2009+MW20090708; Sharon Weinberger, “U.S. Arms Dealer Tests Legal Bounds in Middle East Arms Bazaar,” Wired.com, July 3, 2008, http://www.wired.com/politics/security/news/2008/07/defense_solutions?currentPage=all. Robert Mackey, “Houston Oil Lobbyists Paid for Former Congressman’s Libya Mission,” The Lede, New York Times, April 8, 2011, http://thelede.blogs.nytimes.com/2011/04/08/houston-oil-lobbyists-paid-for-former-congressmans-libya-mission/. Curt Weldon, “Time’s Up, Qaddafi,” New York Times, April 5, 2011. Marcus Baram, “Former Representative Curt Weldon's Close Ties To Gaddafi Led To Libya Trip,” Huffington Post, April 6, 2011, http://www.huffingtonpost.com/2011/04/06/curt-weldon-gaddafi-libya-trip_n_845820.html. Ari Berman, "Weldon's Wild Ride,” The Nation, October 25, 2006. Leslie Wayne, “Italian Arms Contractor and a Pennsylvania Congressman Share Close Ties,” New York Times, October 31, 2009, http://www.nytimes.com/2006/10/31/us/politics/31weldon.html?pagewanted=all. William Bender, "Weldon blasts report labeling him corrupt," Delaware County Daily Times, http://www.delcotimes.com/articles/2006/09/21/today%27s%20stories/17227209.txt. Center for Security Policy, "National Security Advisory Council," Center for Security Policy (accessed June 2002). Michelle Ciarrocca and William D. Hartung, " Axis of Influence,” World Policy Institute, July 2002, http://www.worldpolicy.org/projects/arms/reports/execsumaxis.html. Tom Barry, "The Blame Game,” Right Web, October 10, 2006, http://www.rightweb.irc-online.org/articles/display/The_Blame_Game. John Feffer, "Fearful Symmetry: Washington and Pyongyang," Foreign Policy In Focus, July 1, 2003, http://www.fpif.org/articles/fearful_symmetry_washington_and_pyongyang. John Feffer, "North Korean Fireworks?," FPIF Policy Report. James Kirchick, "Lawmakers attend Moon ‘coronation’ in Dirksen,” The Hill, June 22, 2004.